In the year 1921 life was challenging, but times were especially hard for Leona and her family who had recently lost their mother. At ten-years-old Leona is just one of six siblings. With her mother gone, her father is unable to provide and care for his children, the youngest of whom is just a baby. With nowhere to turn, he takes them to the Brooklyn School and Home for Destitute Children. At first Leona believes it will be just for a short while. Expecting her father to collect them any day, she’s always on the lookout for his return. But he does not come back and eventually, one at a time, her siblings are gone. First her fourteen-year-old brother runs away in hopes of finding a job. Next, with the opportunity of becoming a nurse, her older sister leaves as well. Eventually her other siblings are adopted, leaving just Leona and the baby. Determined to hold on to her last remaining family thread, she’s devastated when, against her will, she’s put on an orphan train to Texas, leaving her baby sister behind. Author Beverly Stowe McClure is a skilled story-teller. As with all her books, she writes with a depth of emotion that helps readers connect instantly with her characters. 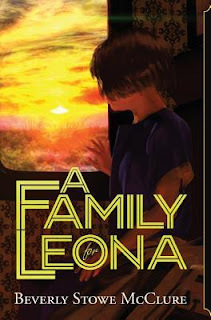 With a page-turning plot and a story which begs to be discovered, A Family for Leona is a book which rises to the occasion for fans of her work and will certainly draw new fans who will come to want more from this exceptionally talented author. Recommended for home and school libraries A Family for Leona is a wonderful book that will speak to the hearts of readers of all ages. Thank you for the wonderful review. I'm so happy you think my story is worthy of an award. My mother was an Orphan Train rider, along with her baby sister. Congratulations, Beverly! What a wonderful honor! Thank you, Karin. I'm happy that the judges enjoyed my story. Thanks for your kind words.